M T D N o v e m b e r 2 0 1 8 12 N e w s / V i e w s Myers Tire Supply will stay Myers Industries Inc. has reversed a deci- sion to relocate its corporate headquarters and Myers Tire Supply offices from Akron, Ohio, to Cleveland. On Sept. 12, 2018, the company announced it would leave Akron, but canceled the move two weeks later. Giti hikes tire prices Giti Tire (USA) Ltd. increased prices up to 5% on passenger, light truck, SUV and CUV tires on Nov. 1, 2018. Prices increased up to 10% on all Giti truck and bus radial (TBR) tires. TBC waives franchisee fee Midas and Big O Tires, two retail brands of TBC Corp., are waiving the initial franchisee fee for eligible first responders. The pro- gram is an extension of an earlier program for U.S. military veterans. Continental recalls HS3 tires Continental Tire the Americas LLC is recall- ing 1,990 Conti Hybrid HS3 Load Range H tires in size 11R22.5 because of potential rapid or slow pressure loss. Hunter adds connectivity Hunter Engineering Co. has added its new autonomous alignment inspection system, Quick Check Drive, to the HunterNet smart technology platform. IFA honors franchisee Big O Tires LLC franchisee Chris Monte- verde has been named the Franchisee of the Year by the International Franchise Association (IFA). GRI redesigns website An application for selecting off-the-road (OTR) tires is among the new features available at the redesigned Global Rubber Industries Pvt. Ltd. (GRI) website. Sri Lanka- based GRI produces construction, material handling and bias and radial agriculture tires. Titan goes pink Titan International Inc. displayed pink farm tires installed on a 1954 Farmall tractor during its fourth Ride to a Cure event Oct. 13 in Des Moines, Iowa. All proceeds and donations benefited the John Stoddard Cancer Center. 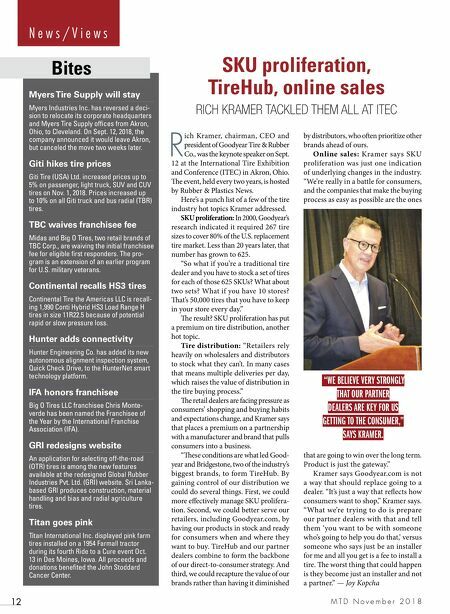 Bites SKU proliferation, TireHub, online sales RICH KRAMER TACKLED THEM ALL AT ITEC R ich Kramer, chairman, CEO and president of Goodyear Tire & Rubber Co., was the keynote speaker on Sept. 12 at the International Tire Exhibition and Conference (ITEC) in Akron, Ohio. e event, held every two years, is hosted by Rubber & Plastics News. Here's a punch list of a few of the tire industry hot topics Kramer addressed. SKU proliferation: In 2000, Goodyear's research indicated it required 267 tire sizes to cover 80% of the U.S. replacement tire market. Less than 20 years later, that number has grown to 625. "So what if you're a traditional tire dealer and you have to stock a set of tires for each of those 625 SKUs? What about two sets? What if you have 10 stores? at's 50,000 tires that you have to keep in your store every day." e result? SKU proliferation has put a premium on tire distribution, another hot topic. Tire distribution: "Retailers rely heavily on wholesalers and distributors to stock what they can't. In many cases that means multiple deliveries per day, which raises the value of distribution in the tire buying process." e retail dealers are facing pressure as consumers' shopping and buying habits and expectations change, and Kramer says that places a premium on a partnership with a manufacturer and brand that pulls consumers into a business. "ese conditions are what led Good- year and Bridgestone, two of the industry's biggest brands, to form TireHub. By gaining control of our distribution we could do several things. First, we could more effectively manage SKU prolifera- tion. Second, we could better serve our retailers, including Goodyear.com, by having our products in stock and ready for consumers when and where they want to buy. 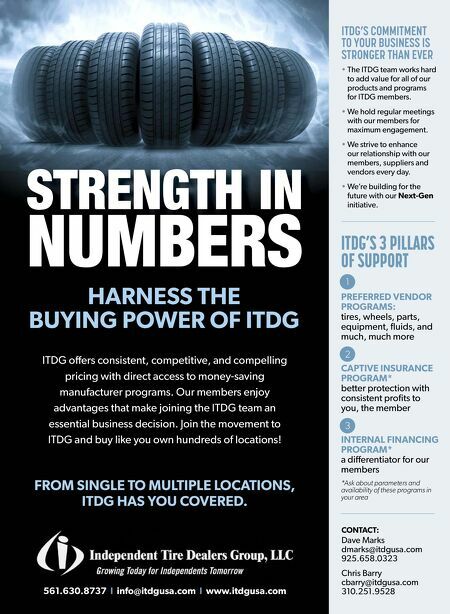 TireHub and our partner dealers combine to form the backbone of our direct-to-consumer strategy. And third, we could recapture the value of our brands rather than having it diminished by distributors, who oen prioritize other brands ahead of ours. Online sales: Kramer says SKU proliferation was just one indication of underlying changes in the industry. "We're really in a battle for consumers, and the companies that make the buying process as easy as possible are the ones that are going to win over the long term. Product is just the gateway." Kramer says Goodyear.com is not a way that should replace going to a dealer. "It's just a way that reflects how consumers want to shop," Kramer says. "What we're trying to do is prepare our partner dealers with that and tell them 'you want to be with someone who's going to help you do that,' versus someone who says just be an installer for me and all you get is a fee to install a tire. e worst thing that could happen is they become just an installer and not a partner." — Joy Kopcha "WE BELIEVE VERY STRONGLY THAT OUR PARTNER DEALERS ARE KEY FOR US GETTING TO THE CONSUMER," SAYS KRAMER.